through 10 distinct “lenses” and belief systems. The New Edition of the 10 Lenses Book! 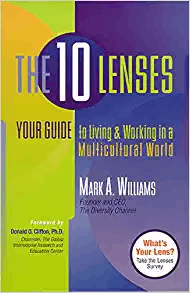 In this ground-breaking, best-selling business book, acclaimed diversity expert Mark Williams introduced the world to ten “eye-opening” lenses to help you, your organization, and everyone in it, understand how belief systems affect the way we live and work. There’s the Assimilationist who believes that everyone should act like a true blue American, and the Culturalcentrist who believes that a person’s race or ethnicity is central to their personal and public identity; the Meritocratist who is sure that if you have the abilities and work hard enough you can make your dreams come true regardless of race or culture, and the Victim/Caretaker whose focus is on social justice and liberation from oppressive forces. Stay tuned as Williams will introduce an 11th lens that’s rooted in the core of society. WHAT ARE THE 10 LENSES?